With only hours left in 2012, officials at the Kars 4 Kids car donation charity are expecting their busiest day of the year. December is traditionally the busiest season of the year for charitable contributions as donors rush to get their last minute tax deductions in place before the ball drops on the new year. "We are expecting our busiest day of an already busy season, and we are fully staffed and even overstaffed," said Kars 4 Kids spokesman Steven Weldler, "We are doing everything possible to ensure that everyone who calls to donate has their call taken promptly and their donation received efficiently." Kars 4 Kids says that they will be open until the last minute to take donations, and donors shouldn't think it's too late until the calendar reads 2013. However, Kars 4 Kids warns it's never a good idea to wait until the last minute for a car donation. 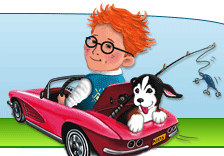 The car donation charity accepts donation on the Kars 4 Kids website as well as by phone at 1-877-Kars-4-Kids.